Εγώ πάντως δεν ξέρω αν θα κρατηθώ ....!!! The all-new Volvo S60 has its world premiere at the Geneva Motor Show on the 2nd of March. It makes its entry into one of the automotive world's toughest segments backed by an extrovert attitude never before seen in Volvo showrooms. The all-new S60 has been sculpted to move you - both physically and emotionally. It is also without a doubt the most dynamic car model Volvo has ever presented - and its Pedestrian Detection with full auto brake is a groundbreaking safety feature. "The sporty design delivers a visual promise of enthusiastic driving characteristics and I can assure you that the all-new S60 truly lives up to that promise. Its driving properties are better than those of any previous Volvo. What is more, the car's innovative new technologies help you become both a better and a safer driver," says Volvo Cars President and CEO Stephen Odell. With the all-new Volvo S60, Volvo Cars is advancing its position in one of the car world's most competitive segments: CD Premium. "The competition is razor-sharp and the customers know exactly what they want. The emphasis is on emotional stance, sporty design and dynamic driving properties. Success in this segment means a lot for the brand's image and we are convinced that the all-new S60 will be one of the strongest contenders," says Stephen Odell. The all-new S60 is sportier and more dynamic than any previous Volvo. But it is still an unmistakeable representative of Scandinavian design at its best. "The S60 has been sculpted to move you. Every single line in its design is there to transport you both physically and emotionally. Its profile radiates so much coupe feeling that the rear doors come as something of a pleasant surprise when you examine the car close-up," says Volvo Cars' Design Director Peter Horbury. Virtually all the lines were penned to carve out the dynamic profile. The C-pillar of the all-new S60 stretches sensually all the way to the tail lamps - and the slim coupe-like roof line is accompanied by a new contour on the shoulders on either side of the lower body, creating a gentle yet powerful double wave from the headlamps at the front to the tail lamps at the rear. The dip in the middle of the double wave visually pushes the car down. This enhances the stance and makes the car look sleeker and lower. The sculpted bonnet and the short overhangs front and rear also emphasise the sports car feel. The all-new S60 is exceptional also from the keen driver's perspective. It is without a doubt the most dynamic car model Volvo has ever presented. "This project has been about pure passion for the task of driving Volvo's chassis development expertise to its very pinnacle. We've crossed into territory where we've never been before," says Stefan Sällqvist, who is in charge of developing the chassis of the all-new S60. The sedan can be specified with a choice of two chassis. On the European market the newly developed dynamic chassis is standard, while most markets in North America and Asia will have the comfort chassis as standard with the sport variant available as an option. The difference between the two chassis alternatives is to be found in the dampers and the front and rear subframes. Here the comfort variant has a somewhat softer setting to give a smoother ride on poorer road surfaces. "The spotlight was on giving the concept of comfort a whole new dimension. The dynamic chassis has an alert, quick-responding architecture that puts the focus on the driving experience, yet without diluting the impression of a comfortable ride," explains Stefan Sällqvist. During the development process, the chassis team carved out a holistic solution featuring changes and refinements for virtually every single detail that influences a car's driving properties. This includes improved steering, stiffer springs and bushes as well as more damping than in any previous Volvo. The software in the AWD (All Wheel Drive) system has been modified to allow the four-wheel drive variants (four-wheel drive is standard in the T6 and optional with the D5) of the all-new Volvo S60 to exploit the sporty new chassis to the limit. All variants of the new S60 can be specified with the advanced, self-adjusting FOUR-C active chassis. The FOUR-C active chassis has been modified and refined for better control and more comfortable feel compared to previous Volvos. The dynamic new chassis in the all-new Volvo S60 is backed up by a range of electronic systems that sharpen the sporty driving experience still further. 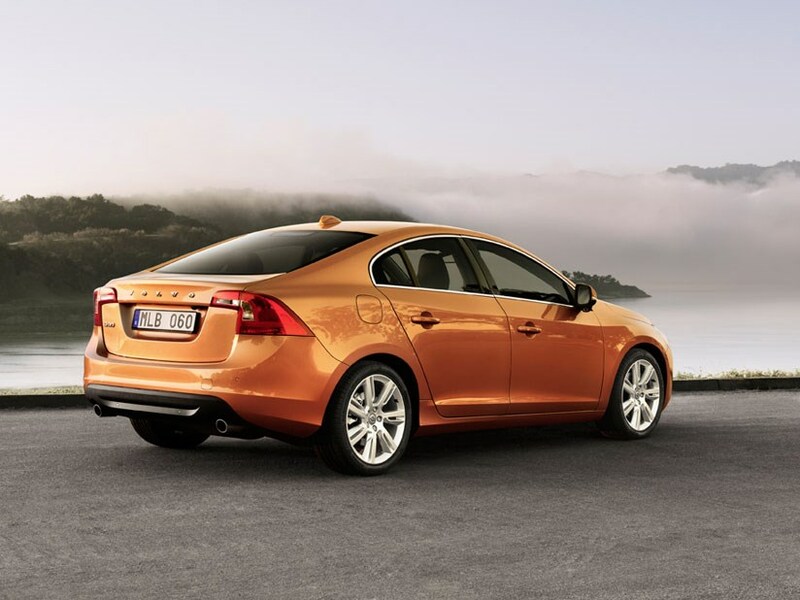 The S60 is the first sedan model on the market with Advanced Stability Control. With a new roll angle sensor, it is possible to identify any skidding tendency at a very early stage. This means that the Dynamic Stability and Traction Control (DSTC) can step in earlier and with greater precision. Advanced Stability Control is a great asset in dynamic driving involving considerable lateral forces, thus improving handling and rapid avoidance manoeuvres. Corner Traction Control is a new feature that uses torque vectoring so the car takes curves even more smoothly. This technology is a further refinement of the DSTC system. When cornering, the car's inner driven wheel is braked at the same time as more power is transmitted to the outer driven wheel. This allows the driver to take the curve more tightly while reducing any tendency to understeer. A highly advanced braking system is an important part of the dynamic driving properties of the all-new S60. The sedan is equipped with a number of features that interact to provide the shortest possible stopping distance in all scenarios. The interior of the all-new S60 takes Volvo Cars to a new dimension in terms of exclusive quality. In addition, Volvo Cars' designers have added in excitement, contrast and playfulness to the rational simplicity of Scandinavian design tradition. "The interior has a more extrovert attitude than before, but without losing any of its practical Scandinavian roots. The all-new S60 brings us up to a whole new level when it comes to the integral experience of colour, form, material and technology," says Peter Horbury. Scandinavian design is often described with rational adjectives such as functionality, simplicity and clarity. When creating the all-new S60, the design team also added in a modern touch, details that generate excitement, contrast and playfulness. The interior of the all-new S60 is lavish in terms of its driver-oriented details, but it is still a five-seater car offering comfortable space for all its occupants. 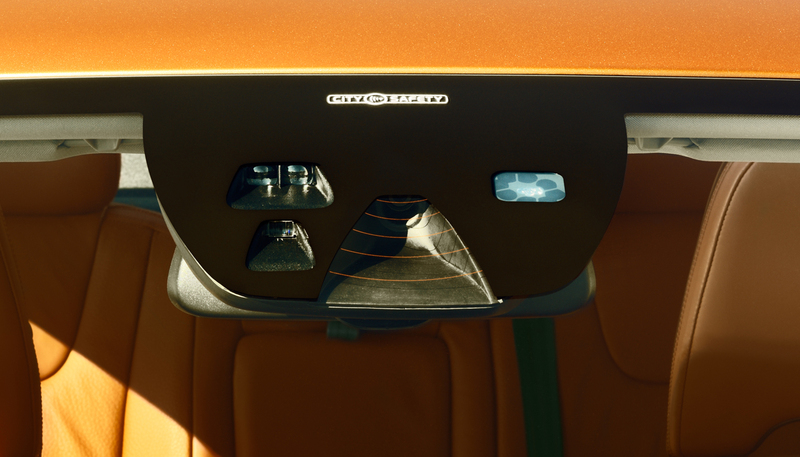 The sculpted outer rear seats give the passenger in the middle welcome side support. Knee space in the rear seat has increased by 30 mm compared with the previous-generation S60. The rear seat splits 40/60 and the boot opening has been made 107 mm wider than in the previous-generation S60. 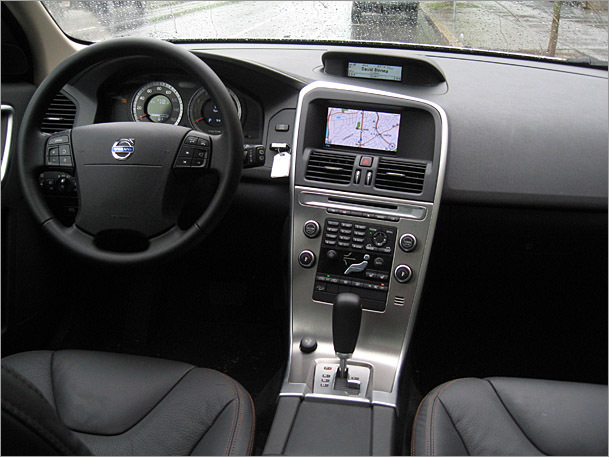 The sporty interior of the all-new S60 is also the most advanced high-tech environment ever offered to a Volvo driver. "The interior of the all-new S60 is all about innovative design in two areas: form and technology. The design is characterised by sporty freshness down to the smallest detail. The technological aspect includes all those smart solutions that contribute to a driving experience unlike that of any other Volvo - from collision avoidance safety and comfort systems to infotainment and audio excellence of absolute world class," says Tomas Ahlborg, Project Director for the all-new S60. Pedestrian Detection with full auto brake is a groundbreaking technological solution. It can detect pedestrians who walk into the road in front of the car, warn the driver - and automatically apply full braking power if the driver does not respond in time. "We are truly proud of our success in making our technology so reliable that we can offer a complete system that can avoid a collision with a pedestrian by detecting, alerting and applying full braking. It's a world first, to the best of our knowledge. With this technology we have increased the braking force in our automatic braking system from fifty percent to full stopping power," says Thomas Broberg, Senior Safety Advisor at Volvo Cars. In an emergency situation the driver first receives an audible warning combined with a flashing light in the windscreen's head-up display. At the same time, the car's brakes are pre-charged. If the driver does not react to the warning and an accident is imminent, full braking power is automatically applied. Pedestrian Detection with Full Auto Brake can avoid a collision with a pedestrian at speeds of up to 35 km/h if the driver does not react in time. At higher speeds, the focus is on slowing down the car as much as possible prior to the impact. A lower speed of impact means that the risk of serious injury is significantly reduced. For instance, if speed is cut from 50 km/h to 25 km/h, Pedestrian Detection with full auto brake is expected to reduce the fatality risk by as much as 20 percent and in some cases by up to 85 percent. 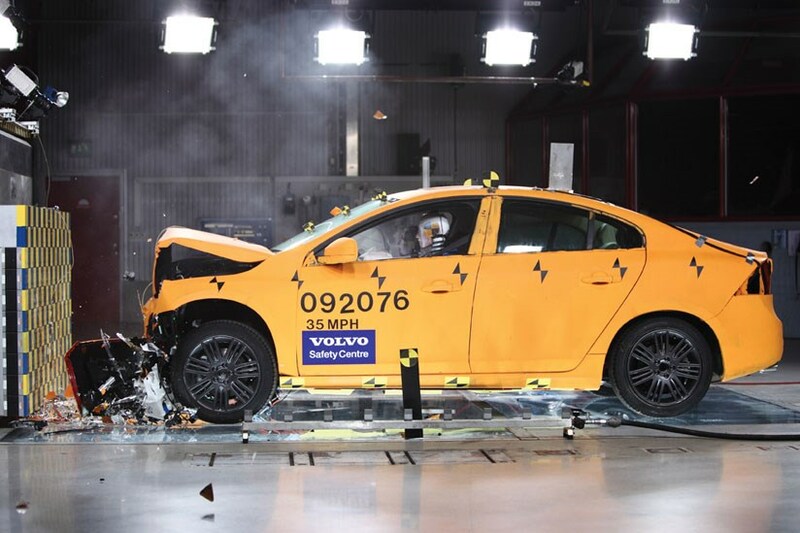 The all-new Volvo S60 also features City Safety as standard. With City Safety, the car automatically brakes if the driver fails to react in time when the vehicle in front slows down or stops - or if he or she is driving too fast towards a stationary object. The system can lessen or even entirely avoid low-speed rear-end impacts at speeds up to 30 kilometres an hour. During its first year of production, the all-new Volvo S60 will be available with a variety of diesel and petrol engines spanning the range from an economical 115 horsepower DRIVe version to an eager high-performance turbocharged version producing 304 horsepower. The T6 petrol engine has a displacement of 3.0 litres and has been improved still further, primarily thanks to lower internal friction. It now pumps out 304 hp and no less than 440 Nm of torque. Acceleration from 0-100 km/h takes 6.5 seconds and top speed is 250 km/h. At the same time, Volvo Cars' engine specialists have succeeded in cutting fuel consumption by about 10 percent to 10.2 l/100 km (EU Combined, preliminary figure). The engine's power is delivered to the wheels via Volvo's second-generation six-speed automatic Geartronic transmission. New valves and lower friction mean faster gearchanges than before. AWD (All-Wheel Drive) is standard on the T6. The new four-cylinder 2.0 GTDi (Gasoline Turbocharged Direct Injection) engine has a displacement of two litres and produces a generous 203 hp, with 300 Nm of torque available from 1750 rpm. Acceleration from 0-100 km/h takes 7.7 seconds with the manual gearbox and 8.2 seconds with the automatic. The top speed figures are 235 km/h (manual) and 230 km/h (automatic). The Volvo S60 2.0T with manual gearbox uses just 7.9 litres of fuel per 100 kilometres (EU Combined, preliminary figure). New Volvo-developed turbocharging technology, direct injection and twin variable camshafts give a unique combination of low fuel consumption, low emissions and high performance across a wide rev range - all in a particularly compact format. The turbocharger is the market's smallest in relation to the engine's maximum power output. Another new feature is that the exhaust manifold and turbocharger are made of sheet steel rather than a heavier casting. A manifold made of sheet steel is admittedly nothing particularly new but thus far it has only been used in combination with a cast turbo housing. The new fully integrated turbo system of sheet steel is a world innovation and has been patented by Volvo. Later during the first year of production, the all-new S60 will also become available as a 2.0 GTDi variant (T5) producing 240 hp and torque of 320 Nm. Furthermore, there will be a 1.6-litre GTDi engine available in two versions: 180 hp (T4) and 150 hp (T3) with torque of 240 Nm. All the GTDi engines will be available in combination with Volvo's automatic six-speed Powershift transmission or a six-speed manual gearbox. The D5 high-performance engine with twin turbos produces 205 horsepower and 420 Nm of torque. Acceleration from 0-100 km/h takes 7.8 seconds (manual and automatic). Top speed is 235 km/h (manual) and 230 km/h (automatic). In the most recent D5 version, which was introduced in spring 2009, the performance and driveability requirements have been met by fitting two turbochargers of different sizes, one taking over from the other and providing added power across a broader rev range. Fuel consumption is 5.9 l/100 km (EU Combined, preliminary figure) with the manual gearbox, putting this engine in the running for best in class. In addition there is the newly developed two-litre D3 producing 163 hp and 400 Nm of torque. Acceleration from 0-100 km/h takes 9.2 seconds (manual and automatic). Top speed is 220 km/h (manual) and 215 km/h (automatic). The new five-cylinder D3 is in principle the same engine as the present 2.4D, but cylinder capacity has been reduced with a shorter stroke to optimise fuel consumption. With a manual gearbox, fuel consumption (EU Combined, preliminary figure) is now down to 5.2 l/100 km with a manual gearbox. Both turbodiesels are available with six-speed automatic transmissions or a six-speed manual gearbox. The D5 can also be specified with all-wheel drive. During the course of the first year of production, a DRIVe version of the all-new S60 will also be introduced, featuring a 1.6-litre diesel engine. Fuel consumption is 4.3 l/100 km (EU Combined, preliminary figure), corresponding to CO2 emissions below 115 g/km. The engine produces 115 hp and 270 Nm of torque, and will only be available with a six-speed manual gearbox. The all-new S60 gets an all-new infotainment system where information from the audio unit, navigation system, mobile phone and other functions is presented on a five-inch or seven-inch colour screen in the upper part of the centre console. The screen is installed high to make it easy for the driver to keep his or her eyes on the road. The audio experience in the all-new S60 has been enhanced compared with previous models. The Volvo S60 is one of the first car models in the world to use Audyssey Laboratories MultEQ technology, the standard for room equalization in the home and professional theatre markets. MultEQ removes distortion caused by the car cabin's acoustics, enabling crisp, clear sound with improved soundstage for everyone in the car. In addition to the top-of-the line Premium Sound, the all-new S60 is available with a choice of three other audio systems. The initial annual target for the all-new Volvo S60 is 90,000 cars. The customer base is spread unusually uniformly throughout the world. Europe (including Russia), North America and the rest of the world will each account for about one-third of total sales. The all-new S60 is built at the Volvo Cars factory in Ghent, Belgium. The first cars will be delivered to customers in early summer 2010. "Irrespective of whether the customers are in the USA, Europe or elsewhere in the world, they all prioritise the same characteristics. Now we are giving them an entirely new S60 that has a unique appeal to even the most discerning of buyers," says Stephen Odell. Πληρης γκαμα λοιπον απο 1.6 150hp μεχρι 3.0 304hp, με δυνατοτητα awd και powershift....τρεμε ανταγωνισμε! Και επειδη το Τ6 το ζαχαρωνω απιστευτα, φαινετε απο το press release οτι τα 20 αλογα τα βρηκαν χωρις τον αμεσο ψεκασμο...δεν ξερω τι προβληματα μπορει να εχουν και δεν το παρουσιαζουν ακομα το μοτερ αλλα περιμενω τουλαχιστον 320 με DI στο low pressure setup....Επισης δεν αναφερεται το κιβωτιο διπλου συμπλεκτη με το συγκεκριμενο μοτερ ουτε φυσικα το μανουαλ...Απο ΜΥ12 μαλλον θα ξεκαθαρισουν τα πραγματα. Γιωργο/Δημητρη, τελικα ποιος ειχε δικιο σχετικα με το μοτερ του νεου S60, εγω ή ο πωλητης? χαχα, βλέπω ανέβασες κι άλλες φωτογραφίες από το καινούριο αμάξι σου .... πάντως το εσωτερικό το περίμενα καλύτερο σχεδιαστικά. johnkyr έγραψε: χαχα, βλέπω ανέβασες κι άλλες φωτογραφίες από το καινούριο αμάξι σου .... πάντως το εσωτερικό το περίμενα καλύτερο σχεδιαστικά. Περιμενω να το δω απο κοντα, αν και για αγορα το βλεπω για ΜΥ13...να εχουν λυθει ολα τα προβληματα, να εχει εμπλουτιστει η γκαμα, και φυσικα να εχει παρουσιαστει (ελπιζω) το R! VolvoZeus έγραψε: Γιωργο/Δημητρη, τελικα ποιος ειχε δικιο σχετικα με το μοτερ του νεου S60, εγω ή ο πωλητης? Τελευταία επεξεργασία από georgosk σε 09 Φεβ 2010, 15:47, έχει επεξεργασθεί 1 φορά συνολικά. Εσυ εισαι νεος....κι εμενα εξακολουθει να με γοητευει αλλα πλεον περισσοτερο με τις οδηγικες του χαρες παρα με το εσωτερικο του...τον Αυγουστο κλεινει 5ετια βλεπεις! Στα 7 χρονια καλο ειναι να αλλαζεις, αν θες να παρεις και καποια χρηματα. Στα 7χρόνια ... όταν ακούσεις την τιμή .... θα το δώσεις στην γυναίκα σου Τα αυτοκίνητα είναι τρύπιος κουμπαράς, η πιο αποδοτική χρήση, είναι αυτή που του κάνει ο δικαστής .... metal2petal , ξέρει πόση απαξίωση τρώει.. οπότε το χαίρεται !!! Το νέο S60 βέβαια δεν το έχουμε δει από κοντά και βέβαια δεν του έχουμε κάνει test drive για να μπορούμε να είμαστε πιο κοντά στην πραγματικότητα. Θέλω να δω ποιος άτυχος πωλητής θα είναι, όταν θα πάμε όλοι μαζί για δοκιμή !!! . Το εσωτερικό του δεν μου αρέσει, μακάρι να βγω ψεύτης.... πολύ κακομούτσουνη η κονσόλα και σε άσχετο σημείο ο κεντρικός αεραγωγός, λίγο αμερικανιά. ίσως και όχι τυχαία. Το V50, το έχω λιγότερο από 1.5χρόνο, άρα δεν με βλέπω για αλλαγή σύντομα. Κάπου στο ΜΥ15, αν έχω τα χρήματα και αν θέλω να τα κάψω στα αυτοκίνητα, μπορεί να δω το Τ5/Τ6 AWD σε σχέση με την αντίστοιχη τότε, νέα BMW3 2.0T. Το πανω μερος της κεντρικης κονσολας του Α4 ειναι μακραν καλυτερο με τους αεραγωγους στη σωστη θεση και συμμετρικους. Της bmw αυτο που το κανει ειναι κατ' εμε τραγικο ειναι η κεντρικη οθονη και το καμπυλωτο σκεπασμα της...ο καλατραβα το σχεδιασε? Απο κει και περα τιποτα το αξιοθαυμαστο...Ειδικα οταν πρεπει να χρησιμοποιησεις το idrive για να αλλαξεις την θερμοκρασια του κλιματιστικου. Το ιδιο και εξωτερικα η μουρη...ελπιζω στο 3D σχεδιο και σιγουρα στα αλλα χρωματα (χαθηκε ενα barrents blue pearl?). Δυο ειναι τα πιο ομορφα στοιχεια του εσωτερικου του S60. Πρωτον η λεπτη κεντρικη κονσολα (χωρις τον μονοφθαλμο αεραγωγο) ειδικα με επενδυση αλουμινιου θα ειναι ολα τα λεφτα. Και δευτερον η σχεδιαση του εσωτερικου της πορτας με τα τοξα αλουμινιου και τα ομορφα νικελ χερουλια (σαν του πρωτου S60 δεν ειναι;). Αλλα επιμενω πως το ταμπλο ειναι πολυ αδειο για τετοιο αυτοκινητο σε αυτη τη κατηγορια. Οσο για τα εσωτερικα των ανταγωνιστων θεωρω το Α4 πολυ διαστημικο που καταντα αχαρο, τη 3αρα ξεπερασμενη και τη merc με τις καθετες γραμμες και τις γωνιες του ταμπλο σου δημιουργει μια βαρια αισθηση (δεν αναφερομαι στην ποιοτητα που ειναι ετσι κ ετσι) και με τη χωστη θεση οδηγησης που εχει δε σε προδιαθετει να ζησεις και πολυ εκει μεσα. Οντως σε barrents blue pearl θα εδειχνε πολυ καλο. Σε αυτο το χρωμα ολα τα volvo δειχνουν ομορφα! Πολλα κουμπια στο κατω μερος της κονσολας και (στο Α5 τουλαχιστον) οχι ιδιαιτερα ποιοτηκη αισθηση στη χρηση τους. άμα πάρεις περίπτερο , πες μου που θα το παρκάρεις να έρχομαι να αγοράζω τσιγάρα !!!!! Όσο για των πίνακα οργάνων θεωρώ ότι είναι ιδιαίτερα κομψός. Ιδίως η νυχτερινή λήψη μου άρεσε πάρα πολύ. Το τιμόνι με το περίεργο σχήμα δεν είναι άσχημο και πιστεύω θα το συνηθίσουμε με τον καιρό! Θεωρώ πάντως ότι αυτές οι φωτογραφίες για το εσωτερικό του νέου μοντέλου, ίσως διαφέρουν άπό την τελική μορφή η οποία θα βγει στην παραγωγή! Πιστεύω πάντως και ελπίζω, πως οι Σουηδοί δεν είναι διατεθιμένοι να παίξουν κορώνα-γράμματα σε έναν τομέα στον οποίο έχουν παραδώσει μαθήματα στο παρελθόν. Και μιλάω φυσικά για την εσωτερική σχεδίαση του εκάστοτε μοντέλου!!! 4628mm long and 1865mm wide, but remains a low-slung 1484mm height. Ο κινητήρας βρέθηκε και είναι αυτός . Για την έκδοση θα δούμε . Επίσης αναμονή για την 4κίνηση. Τελικά βλέποντας τις επιδόσεις μάλλον θα πάμε για Manual. Αλλά γιατί ενώ είναι Τ5 γράφεις 4-cyl. ? Ερωτώ γιατί αν είναι ο ίδιος και το μόνο που αλλάζει είναι το turbo και η πίεση δεν αξίζει τον κόπο. Αλλά αν ο δαίμων του τυπογραφείου έφαγε ένα κύλινδρο τότε δεν το συζητάμε . Με ένα προγραμματάκι θα πάμε στα 280 - 300hp με 2λιτρο κινητήρα. Το αυτοκίνητο είναι πραγματικά όμορφο από όλες τις πλευρές και πολύ μπροστά από τον ανταγωνισμό . Αλλά τι Μ@λ@κι@ με τον αεραγωγό δεν μπορώ να την χωνέψω. Ας τους κάνουμε ένα e-mail μήπως και το σώσουν,,,,,,,,,, Τι Λέτε ? Αυτά έκανε και η SAAB και πούλαγε κάθε Μάιο. Αλλιώς αναμονή να παρουσιαστεί ο Τ5 ! Τελικά μου αρέσει πολύ αυτή η γαμψή μύτη ..
Καμιά σελίδα με υψηλής ανάλυσης φωτό έχουμε ? γράφει Τ5 φαντάζομαι για λόγους marketing, προφανώς θέλουν να μας πουν, ότι θα έχει την απόδοση του παλιού Τ5 αλλά από ότι φαίνεται θα είναι ένας 4κύλινδορς. 5cyl, θα είναι μάλλον μόνο τα diesel, σε βενζίνη 4cyl ή 6cyl. To πρωτοποριακό πάντως, που έχουν αυτά τα μοτέρ, είναι η ενσωμάτωση της τουρμπίνας ΠΑΝΩ στην πολλαπλή εξαγωγής σας ένα κομμάτι. Tα νουμερα των επιδοσεων γενικα μου φαινοντε πολυ συντηρητηκα...περιμενω να δω τα τελικα. Οσον αφορα τις διαφορες μεταξυ των δυο εκδοσεων, ειναι νωρις ακομα για να γνωριζουμε τις διαφορες. Υποπτευομαι παντως οτι ο Τ4 δεν θα εχει αρκετα περιθωρεια μιας και το τουρμπο του ειναι υπερβολικα μικρο, οποτε καλυτερα το Τ5. Τελευταία επεξεργασία από VolvoZeus σε 10 Φεβ 2010, 11:40, έχει επεξεργασθεί 1 φορά συνολικά. πάντως, αλλαγή τουρμπίνας τόσο εύκολα δεν θα γίνεται σε αυτό το S60. Δεν πειράζει αρκεί ο Τ5 να παρουσιαστεί μέχρι το χειμώνα . Το να πάρεις 240 μαμά και με BSR να πας 280+ είναι ιδανικό . θα πέσει στα 6 για 0-100 και θα γεμίζει μετά τα 200 για πλάκα . Ειδικά στα ρεπρίζ δεν θα παίζεται . Αν όπως γράφτηκε μείνουμε στα 1550 κιλά άντε 1600 με καλό εξοπλισμό τότε είμαστε super . Με έφτιαξες με τις Foto μόλις άλλαξα wallpaper . johnkyr έγραψε: To πρωτοποριακό πάντως, που έχουν αυτά τα μοτέρ, είναι η ενσωμάτωση της τουρμπίνας ΠΑΝΩ στην πολλαπλή εξαγωγής σας ένα κομμάτι. Ολα τα τελευταια τουρμπομοτερ εχουν την τουρμπινα ενα κομματι με την πολλαπλη. Το πρωτοπορειακο στην περιπτωση του 2.0 GTDi ειναι το υλικο απο το οποιο ειναι κατασκευασμενη η πολλαπλη. πιστεύω ότι θα την πάρουν πίσω την κονσόλα .... περίμενε εσύ, 2-3 χρονάκια. ασύμμετρη μ@λ@κί@ πραγματικά. Μήπως να τους στείλουμε ένα e-mail, αυτή την φορά σαν club και να ανοίξουμε και μια ψηφοφορία που να αποδεικνύει πόσο άσχημος είναι ο αεραγωγός ? Ποιος από τους δύο; ΓΙΑΤΙ ΚΙ ΟΙ ΔΥΟ ΕΙΝΑΙ ΑΤΑΙΡΙΑΣΤΟΙ ΜΕ ΤΟ ΥΠΟΛΟΙΠΟ ΕΣΩΤΕΡΙΚΟ. deadp έγραψε: Ποιος από τους δύο; ΓΙΑΤΙ ΚΙ ΟΙ ΔΥΟ ΕΙΝΑΙ ΑΤΑΙΡΙΑΣΤΟΙ ΜΕ ΤΟ ΥΠΟΛΟΙΠΟ ΕΣΩΤΕΡΙΚΟ. Να βάλουεμε φηφοφορία και να τους στείλουμε τα αποτελέσματα με mail. johnkyr έγραψε: πιστεύω ότι θα την πάρουν πίσω την κονσόλα .... περίμενε εσύ, 2-3 χρονάκια. ασύμμετρη μ@λ@κί@ πραγματικά. Μήπως να τους στείλουμε ένα e-mail, αυτή την φορά σαν club και να ανοίξουμε και μια ψηφοφορία που να αποδεικνύει πόσο άσχημος είναι ο αεραγωγός ? Πές μου πώς να το κάνω και θα το κάνω. Ας μην μείνουμε θεατές . Ας αναλάβουμε ενέργεια . sprsk έγραψε: Να βάλουεμε φηφοφορία και να τους στείλουμε τα αποτελέσματα με mail.